Today was a long day and it's been a long week. I got home from work today and the only thing I wanted was to have take-out or a big gooey cheesy pizza or box mac n cheese. On days like today I try to take a step back and think about how I'll feel after I eat any of these things. I'm not saying I never have that food but when I'm already stressed the last thing I want to do is stress about how I feel after I eat. 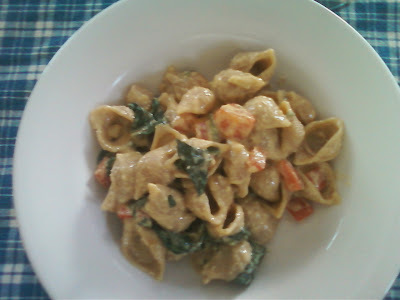 So instead of the tofu scramble we planned on having I decided to whip up a creamy pasta dish. Comforting, creamy, easy, and I already had all the ingredients on hand. I can't take any credit for the recipe- it comes from Oh She Glows. 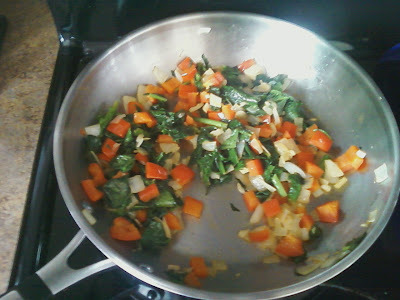 Angela served hers with some sautéed greens and I served ours with sautéed garlic, onions, red pepper and spinach. Basically we used up the veggies left in our fridge. Don't expect alfredo sauce but it really is a nice, creamy sauce. 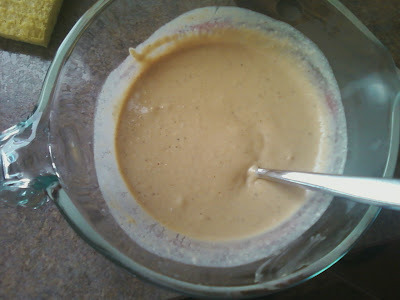 I think I'll play around with the non-dairy milk and try something other than almond next time. Sometimes the almond taste comes through too much for me, even though we use just plain, unsweetened. 1. Cook the pasta according to directions. Cook veggies. 2. Add all ingredients except for pasta and veggies to a blender and blend until smooth. Set aside. 3. When pasta is done, drain it and pour in the sauce and veggies and cook on medium heat until heated through. 4. Serve with a nice glass of red wine, especially if you've had a long week! With just a little teeny bit of work you can skip the processed crap and still have an easy and comforting dinner after a long week. This dish took all of 15-20 minutes. You could even skip the fresh sautéed veggies and add some frozen spinach or broccoli and garlic powder into the mix. Even easier! I was thinking of making this tonight even before I saw it on your blog. Great cravers think alike! Did you end up making it? We added it to our menu again this week!